Cheese Chip Combo - 30 Count Variety Bag. 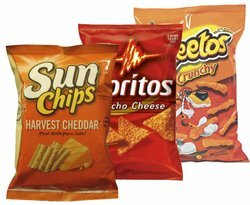 Get 3 very popular chips based on the "Cheesy" theme. Doritos Nacho Cheese, Cheetos Crunchy and Sun Chips Harvest Cheddar. Easy to buy, easier to enjoy.